Response card: Matching husk cardstock and matching envelope (4-3/8x5-3/4) With matching chocolate brown treefree mulberry paper envelope liners (assembly required). Colorful yet Rustic Starfold Wedding Invitation for a Green, Harvest or Fall Event. 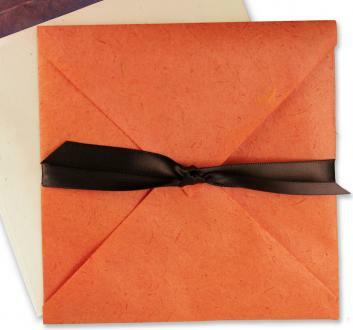 DIY Square Invitation with orange sugarcane paper star-fold wrapper. Very Rustic. Treefree sugarcane starfold wrapper, diecut ribbon holes, scored fold marks and deckled edges. 100% post consumer recycled paper heavy weight invitation card. Chocolate brown envelope liners. PAPER FACTS: Wrapper is made from bagasse fiber (sugercane) which is a post harvest byproduct of the sugar plantations in Thailand. Using the cane for papermaking diverts the cane from being burned or dumped. Bagasse has been used for centuries for paper production. The invitation card and envelopes are made from 100% post consumer recycled paper made in the USA. Husk colored. Ties closed with a length of 1/2 inch chocolate brown satin ribbon. Star-fold wrapper of orange sugarcane and mulberry paper, with small inclusions of sugarcane fiber. Finished edges. Closes with a deep red ribbon. Finished invitation measures 6-1/4" x 6-1/4"
Square Invitation Card: Husk colored recycled cardstock (100% post consumer). Handsome paper. Outer envelope: Matching husk (70lb) square envelope with burgundy mulberry paper envelope liners (assembly required). Invitation Card:Husk cardstock - 100% post consumer recycled paper. Handsome. Wrapper:Star-fold mango paper with four deckled edges. We score fold-marks into the wrapper and die-cut the holes for the ribbon -- for easy assembly. Envelope Liner: Chocolate brown mulberry unryu treefree paper- cut to size.